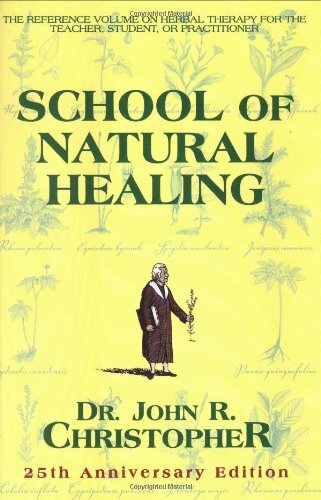 Christopher Publications is proud to offer this 25th Anniversary Edition of School of Natural Healing. Over the years, beginners and herbal practiioners have trusted School of Natural Healing to provide expert instruction on herbal therapy. The worldwide distribution and use of Dr. Christopher's formulas confirms the success and safety of his methods. If you have ever used an herbal combination, it was most likely one of Dr. Christophers's. This text combines his methods and famous formulas in an easy-to-use volume for personal and classroom study. Expanded and revised, we present this work, assured that it will enhance your efforts in natural healing. Dr. Christopher became a Master Herbalist in 1946 after completing course work under Dr. H. Knowles at Dominion Herbal College in Vancouver, British Columbia. In 1948 he received his Naturopathic Doctor degree from the Institute of Drugless Therapy in Tama, Iowa. He continued his studies at the Los Angeles Herbal Institute under the renowned Dr. Edward Shook, receiving his Herbal Pharmacist degree. He practiced as a professional herbalist in the states of Washington, Wyoming, and Utah. He developed a training program for herbalists and organized The School of Natural Healing in 1953. When political legalities kept him from healing patients in his clinic, he fully applied his talents in instruction and provided herbal education for thousands. In addition to lecturing, he wrote and published other works including, Herbal Home Health Care, Capsicum, Every Woman's Herbal, Regenerative Diet, Three Day Cleansing Program, Curing the Incurables, The Cold Sheet Treament, and Rejuvenation Through Elimination. Dr. Christopher's message is "God intended everyone to have the knowledge to properly care for their own body."